In autumn 1938 Messerschmitt was given a contract to design an airframe around the axial-flow turbojets which BMW was developing. At that time the engines were expected to be ready by December 1939, each developing some 1,323-lb (600-kg) thrust. Messerschmitt’s submission, designated originally P. 1065, envisaged engines in the wing roots (they were later fitted beneath the wings) and tailwheel-landing gear; a speed of 599 mph (900 km/h) was expected and the company received an order for three prototypes plus a static test airframe under the designation Me 262. At the same time the Heinkel company was working independently on a twin-jet fighter, the He 280. BMW was having problems with its engine, which on bench tests was only giving 573-lb (260-kg) thrust; the rival Junkers Jumo 004 engine also had problems, so the prototype Me 262 flew on 18 April 1941 with a single Jumo 210G piston engine in the nose. Although acceleration was poor, general handling was good and testing continued in this form to prove various systems before the first BMW 003 turbojets were delivered in November 1941. These were installed in the Me 262 prototype but the Jumo piston engine was retained, fortunately as it turned out since both turbojets failed just after take-off and the pilot managed to keep the aircraft airborne only long enough to complete a circuit and land. The compressor blade failures which had caused the engines to seize necessitated a complete redesign, but the Me 262 could not wait and, since Junkers had overcome most of their problems, the Jumo 004A was chosen as the powerplant. As this engine was heavier and larger than the BMW engine the Me 262 airframe had to be modified, and the third prototype flew with two 1, 852-lb (840-kg) thrust Jumo 004As on 18 July 1942. Test flying continued, although there was a knack in getting airborne, because with the tailwheel landing gear the elevators were ineffective in the tail-down position. It was necessary during the take-off run to touch the brakes lightly, which brought the tail up and so made the elevators effective. This was obviously unacceptable in service, and tricycle landing gear with a non-retracting nose unit was designed and fitted to the fifth prototype, by which time two further prototypes and 15 Me 262A-D pre-production aircraft had been ordered. The landing gear proved satisfactory, and a fully retractable system was introduced on the sixth prototype, which also had l, 984-lb (900-kg) thrust Jumo 0048-1 engines in redesigned nacelles. Following a demonstration before Hitler in November 1943 the Me 262 was given a top-priority production status, but a number of problems both with the airframe and engine still had to be resolved using 12 prototypes and test aircraft. A hold-up in the supply of engines, which were also being built for the Arado Ar 234 bomber, meant that pre-production Me 262A-0 airframes had to be stockpiled, but 16 of these were delivered in April 1944, followed by a further seven in the following month. The Allies’ first photographic evidence of the Me 262 had come in January 1943 when the RAF discovered an Me 262 on the field at Augsburg, and by December 1943 Allied intelligence was beginning to obtain hard data on the Me 262 design. On at least two separate occasions, French citizens employed at the Messerschmitt factory managed to escape with information concerning the Me 262, as well as the Me 163 and He 280. This data prompted the RAF to order 120 Gloster Meteor fighters into production, as well as initiating investigations to better understand the aerodynamic problems associated with transonic and supersonic flight. Similar programs were undertaken in the United States, culminating in the Bell P-59A, Lockheed P-80A, and the experimental Bell XS-1 (X-1). Unofficially called Schwalbe (Swallow), the first production variant was the Me 262A-1a single-seat interceptor fighter and was essentially identical to late pre-production Me 262A-O fighters. It entered service with Erprobungskommandos (EKdo) 262 at Lager-Lechfeld in July 1944. The Me 262A-1a/Jabo was an unofficial designation given to Me 262A-1a aircraft converted in the field for the Blitz-Bomber role by adding bomb pylons and bomb fusing equipment. The Me 262A-1a was considered easier to fly than the Bf 109G in many respects. However, because of the wide range of speeds at which it was intended to operate, its design was something of a compromise. Although it could not turn as tightly as its piston-engined contemporaries, it could hold its speed in tight turns for much longer than conventional fighters. Since the turbojets took time to spool, acceleration and deceleration were accomplished relatively more slowly than with propeller-driven aircraft, but the Me 262A-1a could dive extremely rapidly, and care had to be taken not to exceed its critical Mach number. During climbs and turns the automatic leading-edge slots opened as soon as speed dropped to 280 MPH, and in a glide the slots opened automatically at 185 MPH. Stalling characteristics were good, and there was no tendency to fall away into a spin. There was some directional instability at large angles of yaw, but this was too marginal in impair the performance of the aircraft as a gun platform. The yaw rate was about once per cycle per second, but could be controlled relatively easily with the rudder. Various attempts were made to correct this instability, but the problem was never truly satisfactory resolved. The Me 262A-1a flew fairly efficiently on the power on one engine at speeds of 280-310 MPH, and endurance could be extended to 2.25 hours by turning one turbojet off once an altitude of 25,000 feet had been reached. Pilots were encouraged to restart the engine prior to descending below 10,000 feet since a landing on one-engine was considered dangerous, but could be accomplished by a good pilot. Experiments to develop a practical air-to-air bombing technique using the Me 262 were initiated at Rechlin in December 1944 and continued until March 1945. The standard Revi 16B gunsight was used during the initial tests, but in December 1944 Dr. Kortum of Zeiss completed the development of the GPV 1 (Gegner-Pfeil-Visier, or FlightPath Pointer Sight) for use by the Me 262 in air-to-air bombing. Values for the relative speeds of the Me 262 and the bomber formation to be attacked, the relative altitude from which the bombs were to be dropped, and the necessary ballistic figures for the type of bomb were fed into the GPV 1, which computed a solution to attack the formation in a 20 degree dive. It was proposed to carry out the air-to-air bombing attacks with a formation of four Me 262s, and the bombers were to be approached from ahead and about 3,000 feet above. Six single-seat Me 262s were fitted with the GPV 1 gunsight in January 1945 and used either one AS 500 (l, 102-pound) or two SC 250 (551-pound) bombs to attack American bomber formations. Records from Kommando Stamp, the only unit to fly this type of mission, indicate that some success was attained with the AB 500 bombs, but no confirmed kills were recorded with the smaller weapons. The later variants of the Juno 004B-series more than doubled the operational life of the engine from ten to 25 hours. Compare this to 1996 when it is not uncommon for a large turbofan to remain ‘on the wing’ of an airliner for more than 20,000 hours. The engines were also slightly more forgiving, and allowed more abrupt throttle handling without bursting into flames, a trait that had not endeared the earlier engines to the pilots. And by January 1945 the geared control column first tested on the Me 262V10 was finally being installed in some operational aircraft. These changes made the Me 262 a much easier aircraft to fly, especially for inexperienced pilots. Probably three times as many were in service with new groups that were in the process of forming up, and a further 150 had been destroyed by Allied action or in accidents. It is interesting to note that the Quartermaster-General listed no Me 262 day fighters in operational service, even though this was two months after Hitler had released the aircraft for this mission. 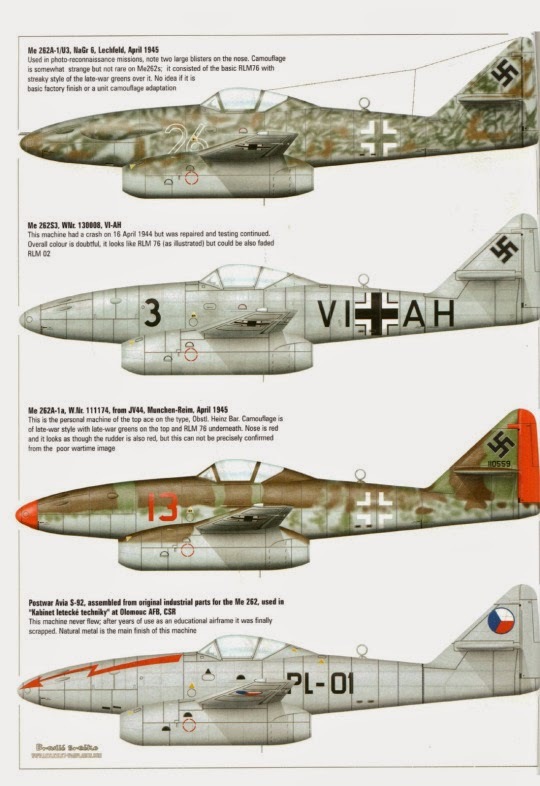 Most of the new units were operational within a couple of months, and on 3 March 1945, the Me 262 fighter units made their first determined efforts to engage Allied bomber formations. Twenty-nine fighters were launched against American raids on Magdeburg, Brunswick, Hannover, and Chemnitz with conflicting results. The Germans claimed six bombers and two fighters destroyed at a cost of a single Me 262. The Americans listed three bombers and six fighters lost with no mention of an Me 262 downed.